This article is about the legendary figure. For other uses, see Roland (disambiguation). While he was vigorously pursuing the Saxon war, almost without a break, and after he had placed garrisons at selected points along the border, [Charles] marched into Spain [in 778] with as large a force as he could mount. His army passed through the Pyrenees and [Charles] received the surrender of all the towns and fortified places he encountered. He was returning [to Francia] with his army safe and intact, but high in the Pyrenees on that return trip he briefly experienced the Basques. That place is so thoroughly covered with thick forest that it is the perfect spot for an ambush. [Charles's] army was forced by the narrow terrain to proceed in a long line and [it was at that spot], high on the mountain, that the Basques set their ambush. [...] The Basques had the advantage in this skirmish because of the lightness of their weapons and the nature of the terrain, whereas the Franks were disadvantaged by the heaviness of their arms and the unevenness of the land. Eggihard, the overseer of the king's table, Anselm, the count of the palace, and Roland, the lord of the Breton March, along with many others died in that skirmish. But this deed could not be avenged at that time, because the enemy had so dispersed after the attack that there was no indication as to where they could be found. Roland was evidently the first official appointed to direct Frankish policy in Breton affairs, as local Franks under the Merovingian dynasty had not previously pursued any specific relationship with the Bretons. 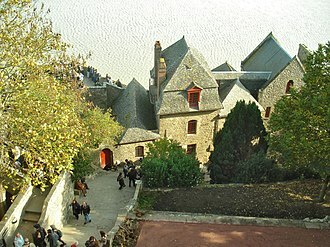 Their frontier castle districts such as Vitré, Ille-et-Vilaine, south of Mont Saint-Michel, are now divided between Normandy and Brittany. The distinctive culture of this region preserves the present-day Gallo language and legends of local heroes such as Roland. Roland's successor in Brittania Nova was Guy of Nantes, who like Roland, was unable to exert Frankish expansion over Brittany and merely sustained a Breton presence in the Carolingian Empire. 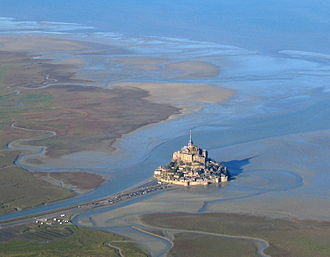 According to legend, Roland was laid to rest in the basilica at Blaye, near Bordeaux, on the site of the citadel. Roland was a popular and iconic figure in medieval Europe and its minstrel culture. Many tales made him a nephew of Charlemagne and turned his life into an epic tale of the noble Christian killed by Islamic forces, which forms part of the medieval Matter of France. The tale of Roland's death is retold in the 11th-century poem The Song of Roland, where he is equipped with the olifant (a signalling horn) and an unbreakable sword, enchanted by various Christian relics, named Durendal. The Song contains a highly romanticized account of the Battle of Roncevaux Pass and Roland's death, setting the tone for later fantastical depiction of Charlemagne's court. It was adapted and modified throughout the Middle Ages, including an influential Latin prose version Historia Caroli Magni (latterly known as the Pseudo-Turpin Chronicle), which also includes Roland's battle with a Saracen giant named Ferracutus who is only vulnerable at his navel. The story was later adapted in the anonymous Franco-Venetian epic L'Entrée d'Espagne (c. 1320) and in the 14th-century Italian epic La Spagna, attributed to the Florentine Sostegno di Zanobi and likely composed between 1350 and 1360. Other texts give further legendary accounts of Roland's life. His friendship with Olivier and his engagement with Olivier's sister Aude are told in Girart de Vienne by Bertrand de Bar-sur-Aube. 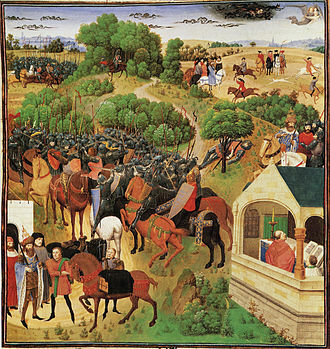 Roland's youth and the acquisition of his horse Veillantif and sword are described in Aspremont. 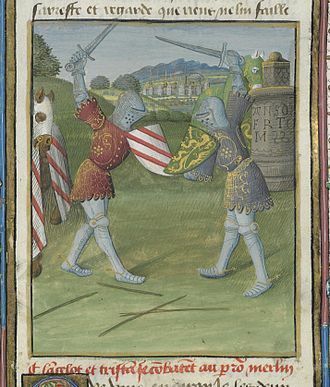 Roland also appears in Quatre Fils Aymon, where he is contrasted with Renaud de Montauban against whom he occasionally fights. 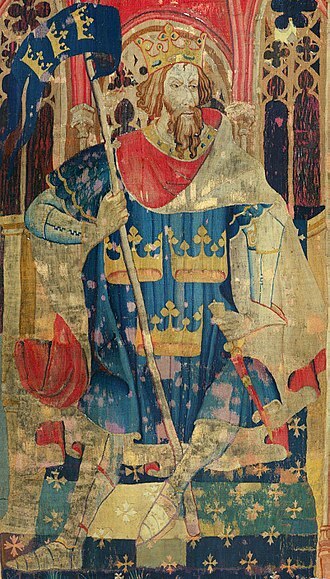 In Norway, the tales of Roland are part of the 13th-century Karlamagnús saga. In the Divine Comedy Dante sees Roland, named Orlando as it is usual in Italian literature, in the Heaven of Mars together with others who fought for the faith. 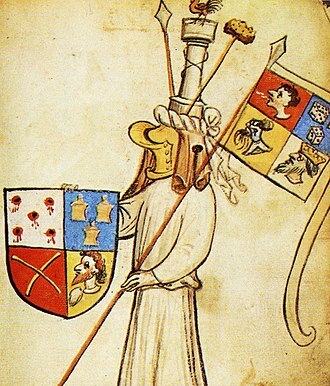 Roland appears in Entrée d'Espagne, a 14th-century Franco-Venetian chanson de geste (in which he is transformed into a knight errant, similar to heroes from the Arthurian romances) and La Spagna, a 14th-century Italian epic. From the 15th century onwards, he appears as a central character in a sequence of Italian verse romances as "Orlando", including Morgante by Luigi Pulci, Orlando Innamorato by Matteo Maria Boiardo, and Orlando furioso by Ludovico Ariosto. (See below for his later history in Italian verse.) The Orlandino of Pietro Aretino then waxed satirical about the "cult of personality" of Orlando the hero. The Orlando narrative inspired several composers, amongst whom were Claudio Monteverdi, Jean-Baptiste Lully, Antonio Vivaldi and George Frideric Handel, who composed an Italian-language opera with Orlando. In Germany, Roland gradually became a symbol of the independence of the growing cities from the local nobility. In the late Middle Ages many cities featured defiant statues of Roland in their marketplaces. The Roland in Wedel was erected in 1450 as symbol of market and Hanseatic justice, and the Roland statue in front of Bremen City Hall (1404) has been listed together with the city hall itself on the UNESCO list of World Heritage Sites since 2004. 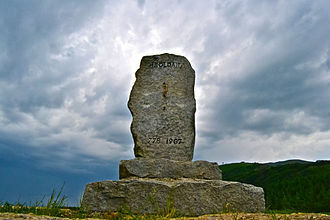 In Aragón there are several placenames related to Roldán or Rolando: la Breca de Roldán (la Brecha de Roldán in Spanish, La Brèche de Roland in French) and Salto d´o Roldán (El Salto de Roldán in Spanish). In Catalonia Roland (or Rotllà, as it is rendered in Catalan) became a legendary giant. Numerous places in Catalonia (both North and South) have a name related to Rotllà. In step with the trace left by the character in the whole Pyrenean area, Basque Errolan turns up in numerous legends and place-names associated with a mighty giant, usually a heathen, capable of launching huge stones. The Basque word erraldoi (giant) stems from Errol(d)an, as pointed out by the linguist Koldo Mitxelena. In the Faroe Islands Roland appears in the ballad of "Runtsivalstríðið" (Battle of Roncevaux). A statue of Roland also stands in the city of Rolândia in Brazil. This city was established by German immigrants, many of whom were refugees from Nazi Germany, who named their new home after Roland to represent freedom. The English expression "to give a Roland for an Oliver", meaning either to offer a quid pro quo or to give as good as one gets, recalls the Chanson de Roland and Roland's companion Oliver. ^ Pastoureau, Michel (2009). L'Art de l'héraldique au Moyen Âge (in French). Paris: éditions du Seuil. p. 197. ISBN 978-2-02-098984-8. ^ Hruodlandus is the earliest Latinised form of his Frankish name Hruodland. It was later Latinised as Rolandus and has been translated into many languages for literary purposes: Italian: Orlando or Rolando, Dutch: Roeland, Spanish: Roldán or Rolando, Basque: Errolan, Portuguese: Roldão or Rolando, Occitan: Rotland, Catalan: Rotllant or Rotllà. ^ Dutton, Paul Edward, ed. and trans. Charlemagne's Courtier: The Complete Einhard, pp. 21–22. Peterborough, Ontario, Canada: Broadview Press, 1998. Einhard at the Latin Library. ^ "Mintzoaren memoria". El País. 2004-09-13. Retrieved 31 July 2014. Lojek, A. – Adamová, K.: "About Statues of Rolands in Bohemia", Journal on European History of Law, Vol. 3/2012, No. 1, s. 136–138. (ISSN 2042-6402). Adriana Kremenjas-Danicic (Ed. ): Roland's European Paths. Europski dom Dubrovnik, Dubrovnik 2006 (ISBN 953-95338-0-5). Susan P. Millinger, "Epic Values: The Song of Roland", in Jason Glenn (ed), The Middle Ages in Texts and Texture: Reflections on Medieval Sources (Toronto, University of Toronto, 2012). "Roland" . The American Cyclopædia. 1879. Chisholm, Hugh, ed. (1911). "Roland, Legend of" . Encyclopædia Britannica. 23 (11th ed.). Cambridge University Press. pp. 464–465. Orlando Innamorato is an epic poem written by the Italian Renaissance author Matteo Maria Boiardo. The poem is a romance concerning the heroic knight Orlando and it was published between 1483 and 1495. To material largely quarried from the Carolingian and Arthurian cycles, Boiardo added a superstructure of his own making, the poem, written in the ottava rima stanza rhythm, consists of 68 cantos and a half. Boiardo began the poem when he was about 38 years old and he is believed to have continued till 1486, but left the poem unfinished. The last verses say, Mentre chio canto, Iddio Redentore vedo lItalia tutta a fiamma e foco, meaning that during his work at the poem Boiardo could see all Italy in war. The first two books were published sometime between 1482 and 1483, most likely by Pietro Giovanni di San Lorenzo in Reggio, and it most likely bore the title Linnamoramento de Orlando. The third book first appeared in 1495 under the title El fin del inamoramento de Orlando, the first complete edition was published in 1495. Like the editio princeps, the first complete edition of 1495 has been completely lost, the oldest copy which came down to us is the 1487 reedition of the first two books, only one copy exists, kept at the Biblioteca Marciana. There is only one extant copy of the 1495 Venetian edition of the third book, the oldest complete edition we have is dated 1506, there remains only one copy, kept at the Marciana. The beautiful Angelica, daughter of the king of Cataio, comes to Charlemagne’s court for a tournament in which both Christians and pagans can participate. She offers herself as a prize to whoever will defeat her brother, but the second knight to fight, kills Argalia and Angelica flees, chased by leading paladins, especially Orlando and Rinaldo. Stopping in the Ardenne forest, she drinks at the Stream of Love, while Rinaldo drinks at the fount of hate, Orlando comes to kill Agricane and to free her, and he succeeds. Afterwards, who has escaped from the island, tries to convince him to return to France to fight alongside Charlemagne, consequently. In all, eighteen battles were fought in what is now northwestern Germany. They resulted in the incorporation of Saxony into the Frankish realm, despite repeated setbacks, the Saxons resisted steadfastly, returning to raid Charlemagnes domains as soon as he turned his attention elsewhere. 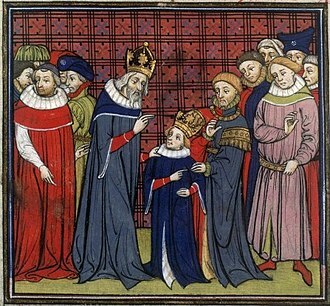 This agreement saved the Saxons leaders exceptional rights in their homeland, Widukind was baptized in 785 and buried in the only Germanic church without a spire. The Saxons were divided into four subgroups in four regions, nearest to the ancient Frankish kingdom of Austrasia was Westphalia, and farthest away was Eastphalia. In between these two kingdoms was that of Engria and north of three, at the base of the Jutland peninsula, was Nordalbingia. In mid-January 772, the sacking and burning of the church of Deventer by a Saxon expedition was the Casus belli for the first war waged by Charlemagne to the Saxons. It began with a Frankish invasion of Saxon territory and the subjugation of the Engrians, Irminsul may have been a hollow tree trunk, presumably representing the pillar supporting the skies—similar to the Nordic tree Yggdrasil and apparently a common belief among the Germanic peoples. Charlemagnes campaign led all the way to the Weser River and destroyed several major Saxon strongholds, armed confrontations continued unabated for years. Charlemagnes second campaign came in the year 775, he marched through Westphalia, conquering the fort of Sigiburg, and crossed Engria, where he defeated the Saxons again. Finally, in Eastphalia, he defeated them, and their leader Hessi converted to Christianity and he returned through Westphalia, leaving encampments at Sigiburg and Eresburg. All of Saxony, except for Nordalbingia was under his control, after warring in Italy, he returned very rapidly to Saxony for the third time in 776, when a rebellion destroyed his fortress at Eresburg. The Saxons were once brought to heel, though Widukind fled to the Danes. Charlemagne built a new camp at Karlstadt, in 777, he called a national diet at Paderborn to integrate Saxony fully into the Frankish kingdom. The chief purpose of the diet was to bring Saxony closer to Christianity, mainly Anglo-Saxons from England, were recruited to carry out this task. The Song of Roland is an epic poem based on the Battle of Roncevaux in 778, during the reign of Charlemagne. It is the oldest surviving work of French literature and exists in various manuscript versions. The date of composition is put in the period between 1040 and 1115, a version beginning around 1040 with additions and alterations made up until about 1115. The final text has about 4,000 lines of poetry, set in the Carolingian era, it was written much later. There are nine extant manuscripts of the Song of Roland in Old French, the oldest of these manuscripts is held at the Bodleian Library at Oxford. This copy dates between 1129 and 1165 and was written in Anglo-Norman, scholars estimate that the poem was written, possibly by a poet named Turold, between approximately 1040 and 1115, and most of the alterations were performed by about 1098. Some favor an earlier dating, because it allows one to say that the poem was inspired by the Castilian campaigns of the 1030s, and that the poem went on to be a major influence in the First Crusade. Those who prefer a dating do so on grounds of what they interpret as brief references made in the poem to events of the First Crusade. 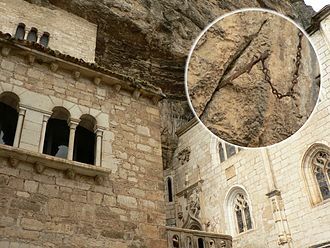 In the poem, the term doltre mer or loltremarin comes up three times in reference to named Muslims who came from oltre mer to fight in Spain and France. 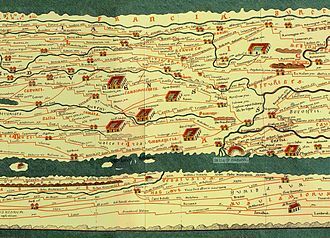 Oltre mer, modern French Outremer, literally oversea, beyond sea, other side of the sea, is a native French term from the classical Latin roots ultra = beyond, the name was commonly used by the Crusaders for Palestine. The bulk of the poem is adjudged to date from before the Crusades, early editors of the Song of Roland, informed in part by patriotic desires to produce a distinctly French epic, could thus overstate the textual cohesiveness of the Roland tradition. This point is clearly expressed by Andrew Taylor, who notes, he Roland song was, if not invented, Charlemagnes army is fighting the Muslims in Spain. They have been there for seven years, and the last city standing is Saragossa, threatened by the might of Charlemagnes army of Franks, Marsile seeks advice and his wise man, councils him to conciliate the Emperor, offering to surrender and giving hostages. Vita Karoli Magni is a biography of Charlemagne, King of the Franks and Holy Roman Emperor, written by Einhard. Historians have traditionally described the work as the first example of a biography of a European king, the author tried to imitate the style of that of the ancient Roman biographer Gaius Suetonius Tranquillus, who is most famous for his Lives of the Caesars. Einhards biography used especially the model of the biography of Emperor Augustus, the date of the work is uncertain, and a number of theories have been put forward. The inclusion of Charlemagnes will at the end of the work makes it clear that it was written after his death in 814. The first reference to the work, comes in a letter to Einhard from Lupus of Ferrieres, no theory has yet emerged as an obvious frontrunner, and it is likely that debate will continue. Einhards book is about intimate glimpses of Charlemagnes personal habits and tastes and he occupied a favoured position at Charlemagnes court so he had inside information. Einhard received advanced schooling at the monastery of Fulda sometime after 779 and he was an exceptional student and was quite knowledgeable. 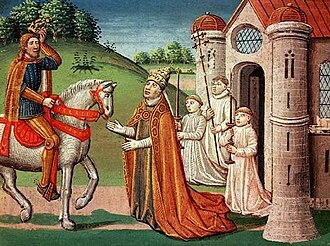 The word was sent to Charlemagne of Einhards expertise and he was sent to Charlemagne’s Palace School at Aachen in 791. Einhard received employment at Charlemagnes Frankish court about 796 and he remained at this position for twenty some years. Einhards book was intended to convey his appreciation for advanced education. He wrote his biography after he had left Aachen and was living in Seligenstadt, Einhards position while with Charlemagne was that of a modern minister of public works so he had intimate knowledge of his court. Einhard was given the responsibility of many of Charlemagnes abbeys and it used to be suggested that Einhards wife, was a daughter of Charlemagne, that can generally be disregarded as a twelfth-century fabrication, since there is no proof. Most biographies of the Middle Ages related only good deeds of their subject, Einhards biography, however, is considered, for the most part, to be a trustworthy account of Charlemagnes life. The eight phases of The Song of Roland in one picture. Detail of manuscript showing "AOI"
The death of Roland at the Battle of Roncevaux, from an illuminated manuscript c.1455–1460. 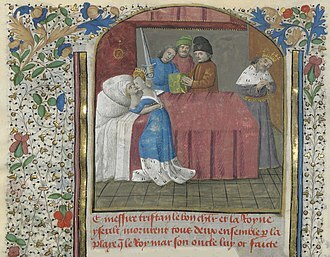 Charlemagne finds Roland dead (14th-century miniature). 1655 edition by Giovanni Battista Brigna, Venice. Italian translation of Herodotus' Histories by Count Matteo Maria Boiardo, published in Venice in 1533. Luigi Pulci in a fresco by Filippino Lippi. Equestrian statue of Roland astride Veillantif in Haldensleben, Saxony-Anhalt, Germany, in front of the town hall.